Soil degradation occurs where our activities (either directly or indirectly) cause soil to become less vigorous or less healthy. 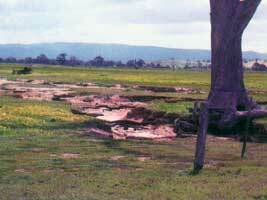 Soil salinity is the accumulation of salts in a soil profile such that it limits plant growth. 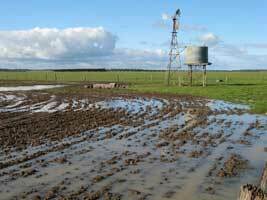 Additional information about the process of soil salinity is available on the VRO website. 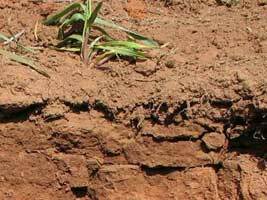 Compaction is where soil particles pack together increasing soil density and reducing pore space. Trafficking (by animals as well as by vehicles) and cultivation are the primary causes of this form of soil degradation. Additional information about the process of compaction is available on the VRO website. 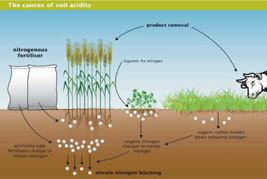 Acidification is a decrease in soil pH that usually results in a reduction in plant vigour. Additional information about the process of acidification is available on the VRO website. Waterlogging is where water saturates the profile usually due to reduction in infiltration and transmission of water into soil. Additional information about the process of waterlogging is available on the VRO website.